The object of a game, depending on the selected scenario victory conditions, is to be the first player to gain a set number of Victory Medals. One or more Victory Medals are gained for each enemy unit eliminated. When the last figure of an enemy unit is eliminated, a Victory Medal(s) is placed on your Victory Medal Card. In some scenarios, additional Victory Medals may be gained by capturing certain terrain hexes or other battlefield objectives. Victory is achieved the instant the last Victory Medal required is gained. Select a battle from the scenario section. Each scenario specifies which army is at the top or bottom of the battlefield, and players should sit on the side closest to the army they will command. Place the terrain tile hexes, markers and tokens on the battlefield, as indicated by the scenario map. Place the units onto the battlefield, matching the various units’ positions to the scenario map. 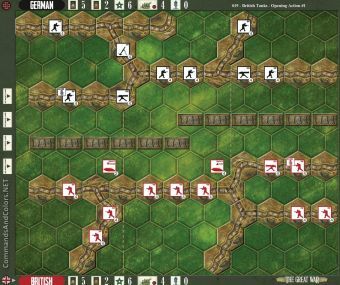 Each unit symbol on the map represents an entire unit of figures on the battlefield. A tank unit is one figure and a number of tank silhouette tokens. Each player takes a Victory Medal Card and places the card next to their board edge. Each player takes a numbered reserve artillery token, as indicated in the scenario notes, and places it next to their board edge with its proper strength number facing up. Shuffle the command card deck thoroughly and deal the number of command cards to each player, as indicated by the scenario notes. Keep your command cards a secret from the opposing player. Set the remaining deck of command cards facedown alongside the game board. Shuffle the combat card deck thoroughly and deal the number of combat cards to each player, as indicated by the scenario notes. Keep your combat cards a secret from the opposing player. Set the remaining deck of combat cards facedown alongside the game board. Create a common pool of HQ tokens, alongside the battlefield near the deck of combat cards. Each player takes the number of HQ tokens from the common pool as indicated by the scenario notes and places them next to their board edge. Set the WWI battle dice, targeting dice, targeting templates, bogged down markers and the Victory Medal tokens alongside the battlefield near the deck of command cards. 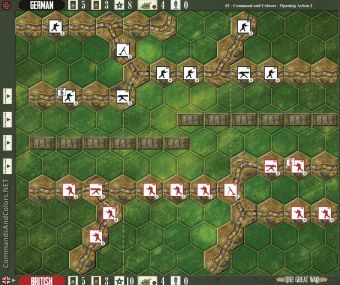 Review all special rules and victory conditions that apply to the scenario. Prior to the start of a battle, when No-Man’s-Land Shelling rules are in effect for the scenario, the starting player will roll for the shelling of No-Man’s-Land, to determine the placement of shell craters. The starting player, as indicated in the scenario notes, takes the first turn to begin play. The scenario notes will state which player moves first. Players then alternate taking turns, until one of the players reaches the number of Victory Medals indicated by the scenario victory conditions.